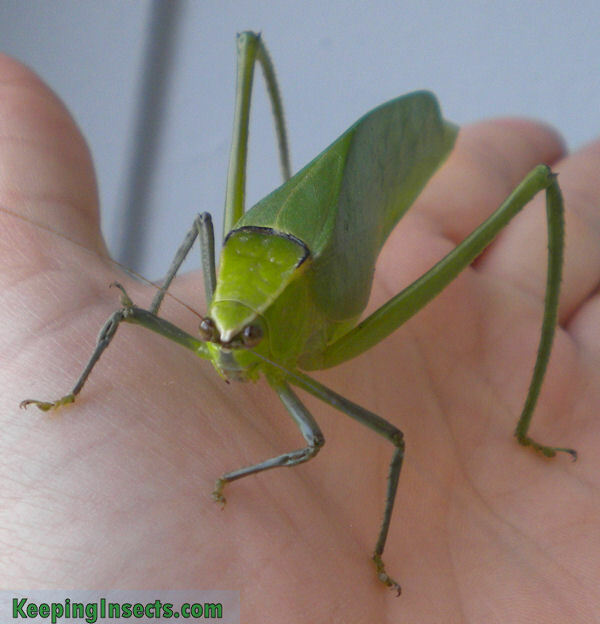 You can also keep katydids as pets. This page is about the Giant Katydid Stilpnochlora couloniana, a beautiful leaf-like katydid from Cuba. Here you can read all about appearance, housing, feeding and breeding this gorgeous strange species. An adult Giant Katydid female. The Giant Katydid, Stilpnochlora couloniana, is lime to dark green in color and has brown eyes. When adult the wings extend far past the abdomen and look like a glossy leaf of a tree of shrub. The nymphs are paler green and have some dark brown markings on their back and legs. The body of an adult female is around 4 cm long, including its wings its total length is 7 cm. The males are slightly smaller and less bulky, including wings the male is about 6 cm long. The males also have a more narrow body and have longer antennae. The hind legs of this species are designed for jumping and are very prominent with their 7 cm each. Adult Stilpnochlora couloniana katydids are generally quite docile and do not jump as often as the nymphs do. The first reaction of adults is to stay still, after that to jump and fly away. The nymphs can jump at even the minutest disturbance, sometimes making it hard to change the plants in their enclosure. This species is night-active, meaning that they are quiet during the day but will move around and feed when the lights go out. Males can produce a song to attract females by rubbing their legs to their wings. This is not a continuous sound like in crickets, but rather short and not as intense as with crickets. An adult Giant Katydid female. You can see that the wings are much longer than the body. 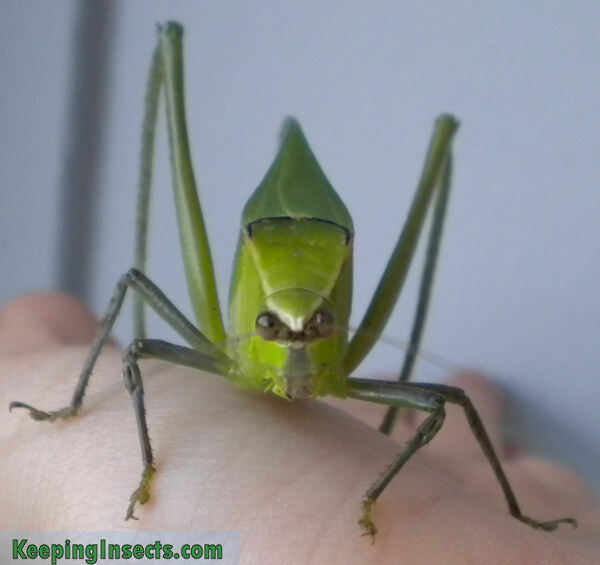 The enclosure for your Giant Katydids needs to be big enough to house them and their food. You need at least 30 cm in height, but more is always better. 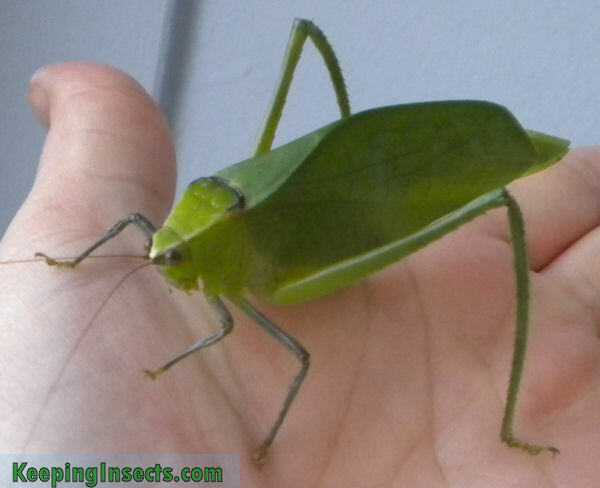 For one couple adult katydids you need around 30 x 30 x 30 cm or more, preferably double that size. The enclosure should be bigger if you house more than one adult couple or many nymphs. The enclosure should be well ventilated by one or more mesh sides to it. You can also house them in an enclosure completely made of mesh or gauze to maximize ventilation. Keep the temperature at 25 to 30° C. The humidity should be high for this species; spray with water every day and make sure the substrate on the bottom of the enclosure stays moist. More about maintaining proper temperature and humidity, you can read here. Especially the nymphs need a light place to life! Do not put them in direct sunlight, but be sure to place them somewhere light or supply them with a light bulb. This species of katydid exclusively feeds of plants. It will eat leaves of oak, bramble, hazel, hypericum, butterfly bush (Buddleja), apple, rose and hawthorn. You can keep the leaves fresh by cutting off branches and placing them in a cup of water. Be sure to cover up the water by leaves or a cloth if you have young nymphs, otherwise they could drown in the water. An adult Giant Katydid female seen from the front. It is not hard to breed Giant Katydids. You just need an adult couple, plenty of food, humidity and the proper temperature. When the environment is right for them, they will breed by themselves. The female will find a suitable branch for the eggs. She will first nibble on the branch to give it a rough coating, and then she will glue her eggs onto this. The eggs are laid on a long string, she can lay up to 100 to 150 eggs per batch! It takes around 40 to 60 days for the eggs to hatch. The eggs need a lot of humitidy and a temperature of around 25 to 30 °C. The young nymphs are very fragile and can jump already pretty far. Keep them together in a big enclosure with plenty of light and fresh leaves. The air humidity is extremely important for nymphs, as low humidity will cause them to get stuck in their skin when molting. When molting from subadult to adult low air humidity will cause them to develop crooked and malformed wings. 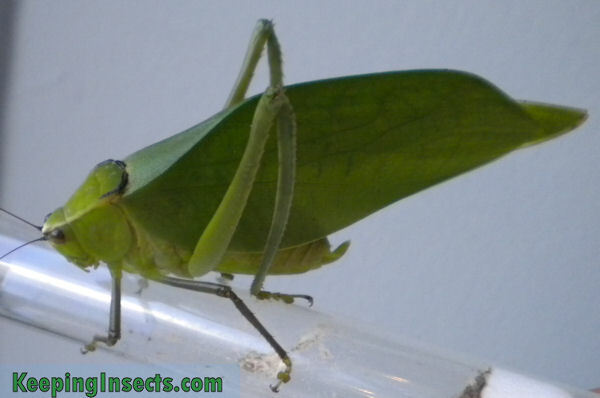 Interested in other katydids? 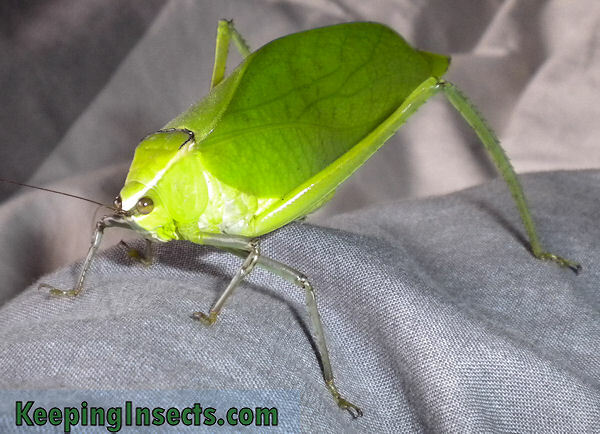 Check out our Ventralla Katydid page.